The managing director of the International Monetary Fund, Christine Lagarde, has said she still intends to attend an investment conference in Saudi Arabia later this month despite concerns over the disappearance of journalist and U.S. resident Jamal Khashoggi. Khashoggi disappeared after he entered a Saudi consulate in Istanbul, Turkey, more than a week ago. The Washington Post cited anonymous sources as saying Turkey's government told U.S. officials that it has audio and video proof that Khashoggi was killed and dismembered. The AP has not yet confirmed that report. Saudi Arabia says Khashoggi left the consulate. Lagarde said Saturday in Bali, Indonesia, that "human rights, freedom of information are essential rights. And horrifying things have been reported and I am horrified." She said she would "speak my mind" if she does go. The International Monetary Fund has wrapped up its annual meeting pledging to act to protect world growth and financial stability from risks linked to trade and geopolitical tensions. 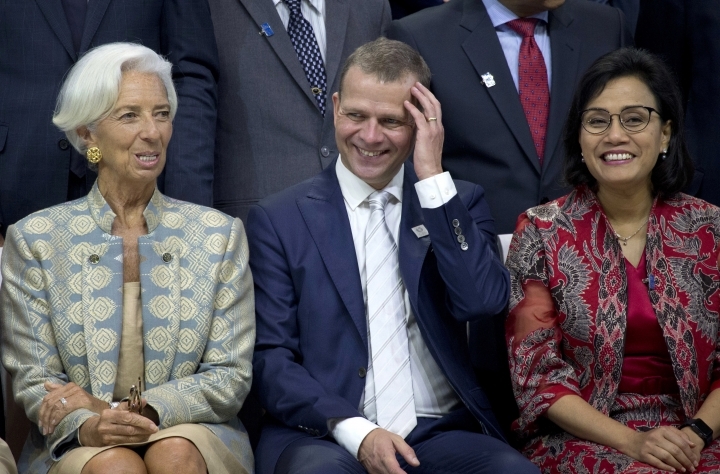 IMF Managing Director Christine Lagarde said Saturday as the IMF-World Bank meeting in Bali, Indonesia, ended that global growth is still strong but has plateaued. Countries should seek to ensure they do not "drift." She said: "Sail together and we will be stronger. Focus on your policies. Don't drift and let's cooperate as much as we can because we will be better off together." The International Monetary and Financial Committee, which advises the IMF's board of governors, urged countries to keep credit available in line with their levels of inflation and seek to raise economic growth "for the benefit of all." U.S. Treasury Secretary Steven Mnuchin has downplayed widely voiced concerns over the risks that trade tensions with China could disrupt the world economy. Mnuchin also told reporters Saturday in Bali, Indonesia, that he doesn't lose sleep over the possibility that China might sell its huge hoard of U.S. treasuries in retaliation. Concerns that trade friction between Washington and Beijing will depress global trade and generate turmoil in financial markets have been a major theme of global finance meetings this week in Bali. The annual meeting of the International Monetary Fund and World Bank, and a slew of other financial gatherings on the sidelines, was winding down Saturday.